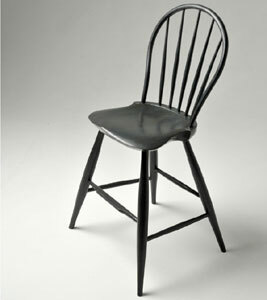 Well, I signed up for the Windsor Chair class at Highland next week and I can’t wait. We start out with Peter Galbert doing two days of demonstration and lecture and then we spend the next five days actually making a chair by hand. I took a chair-making class last summer up in New Hampshire and it was really enjoyable. I presume that many of the basic principles are the same (I mean if the basic principles are not the same, then you might end up with an apple pie, right? ), so maybe I will not have to re-learn everything. My first Windsor was a “sack back” and it is a beautiful and lasting object. This class is about making a child’s Windsor and it looks to me as if it will be a thing of beauty (and a joy forever). I went over to Galbert’s web site to see some of his work and to get to know the guy a little bit before the class. I think I like him already – anybody who keeps goats can’t be all bad. He writes on his blog about the class upcoming at the High and it turns out what he will do is take the first two days, Saturday and Sunday, to actually make a chair as a demonstration. I like that. I am a visual person and I look forward to seeing the whole process all the way through and then doing it myself in the week after. One thing I will do during the class is take lots of pictures and notes, since I failed to do that last summer and have regretted it since. There is just a whole bunch of information to be absorbed and it is difficult to remember all of it. There is still room in the class, so pack up your tools, order the ones you don’t already have, come on down to the High, meet Peter and end up with a beautiful handmade child’s Windsor chair. You realize of course, this will open up all kinds of future projects because “If you can build a chair, you can build anything”. Go ahead and revise your will too, because the grandkids are going to fight over who gets this chair when you are gone. By the way, I will be blogging it each day so your picture will likely end up on the Highland blog. This is going to be fun! !